Derrick Anderson, the Chief Executive of Lambeth Council, who was voted as a Public Leader of the Year in the Guardian Public Services Awards 2012, spoke in the 7th Quality Conference in Vilnius about how citizens should be focus of the service development and how civil servants and local politicians should support them and thus provide new opportunities for localism. The other reason why citizens should be in the centre of the public sector transformation is that they are new resources in service delivery. There is a need for a radical transformation in the UK, because public sector has 50 per cent less spending between 2010 and 2016 at the local level. There are three strategies to cut public spending: salami slicing; asset disposal, rationalization, pricing services; and radical transformation of service delivery linked to citizens. Anderson voted for the third strategy. Citizens should be the ones who determine polities and deliver services. Derrick told us a story about how he involved citizens in cooperative commissioning of public services in 2009 after he realised that local states should make cuts and old ways didn’t work anymore. Local states needed to renegotiate the relationships between the citizens and the local government. As a result of these negotiations they issued a policy paper introducing new ways of co-production. This paper introduced service design concepts as key policy principals: collaboration, building networks and loving your place were pathways to a better future. Lambeth Council worked out in workshops how the council and citizens should work together and how citizens could be encouraged to be a part of a cooperative council. Local states also engaged 3000 citizens in making surveys, interviewing stakeholders and becoming members of a citizen council. 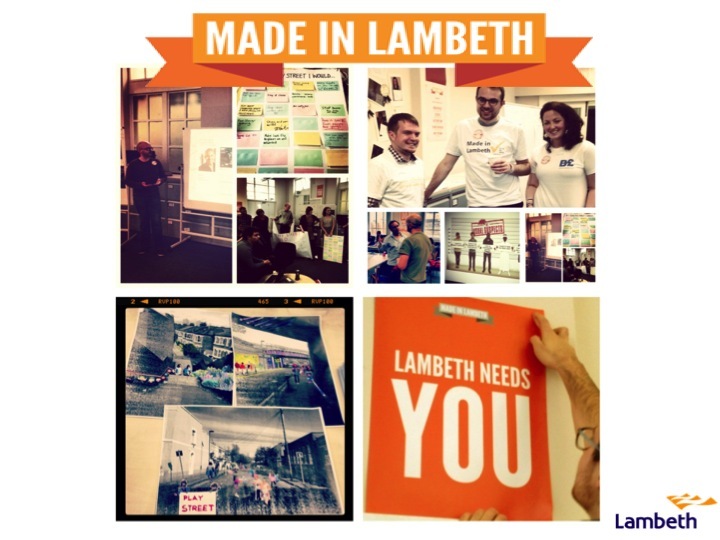 Lambeth Council found out that the local state needed support and a strong voice; that they should let go off the traditional ways of producing services and give the local state some money to do this and that they should build infrastructure (= community based management) to make this transformation happen. Council also found out that this transformation needs strong motivation, innovation methods, creative citizens, social capital and networks. The local state should facilitate this change process with interaction, spaces, networks, learning, money and procedures. This change from a served community to a collaborative community is a challenge for a council member. The roles of a good politician and a civil servant need to be redefined. There are two new roles for citizens and for elected council members. Citizens are co-deliverers of the service and elected council members work as anchors to the new service delivery in their own area. Instead of using 80 percent of the budget to serve 20 per cent of citizens, it is possible to use assets based resources and create new services in collaboration, which brings in more resources. For example, 30 citizens redesigned council websites over a weekend with 300 pounds instead of 60 000 pounds, a sum that a private company would have charged for the work; or 500 citizens became Green Community Champions, volunteering to improve their local environment. In this new role Lambeth Council have to learn how to orchestrate citizen engagement and how to use ICT, HR and procurement to build capacity in the community. They also need to learn how to match assets with needs and support infrastructure to make it work. To give an example, in Lambeth closed shops and libraries are used for pop-up workshops, where councillors and local residents create new ideas. Task given in a workshop can be, for example: this is the resource, use it locally and co-design a way to run a children´s playground with 30 percent less money. Derrick ended his speech saying: “If you find local people who are willing to do it and you support the change, change happens”. This blog post was created as an assignment in SID course The Current Topics. This is an amazing conference. I would have loved to hear it! But the Lambeth case seems quite extreme! Indeed, the 7th Quality Conference in Vilnius was very inspiring with great good practice cases on co-design, in particular from Belgium and France. These case studies will be in our Good Practice Hub http://www.govint.org/good-practice/ soon. I am sure that with Tuula’s help we will soon be able to feature some Finnish coproduction case studies as well. If you have some good practice to share on co-commissioning, co-design, co-delivery or co-assessment please get in touch! Indeed, the 7th Public Service Quality Conference in Vilnius was very inspiring with lots of good practice cases on service and policy co-design. We’ll feature the most exciting presentations on our website shortly!